The Utah School to Work Initiative aims to ensure transition age youth (ages 14-22) with intellectual or developmental disabilities (including those with the most significant disabilities) are engaged in competitive, integrated employment regardless of where they live in the state. In 2016, Utah was awarded the Partnership in Employment (PIE) grant that is sponsored through the Administration for Community Living. 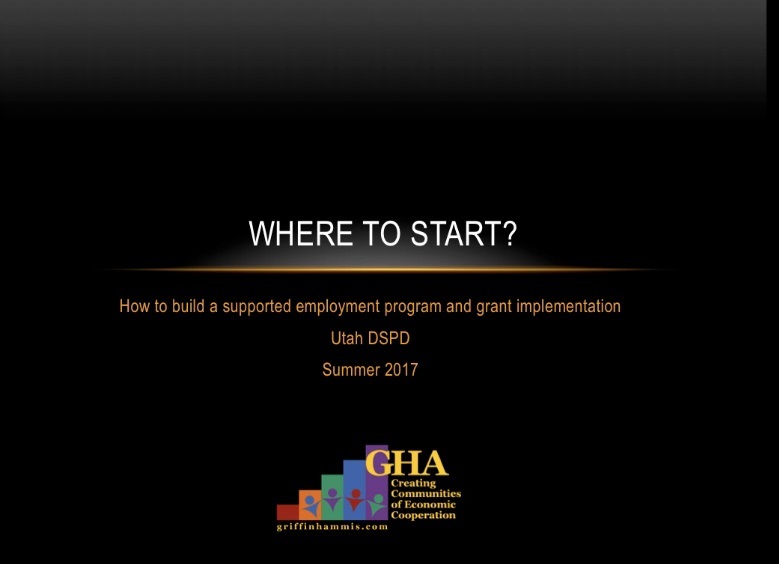 Through this grant, Utah will be able to expand the School to Work pilot project that was supported by the US Department of Labor, Office of Disability Employment Policy (ODEP). This grant allows the Division to work with two school districts per year over five years, working directly with schools on implementing necessary changes in service delivery to improve employment outcomes for youth with disabilities. It is the fundamental belief that all individuals are employable. We are committed to the vision of emphasizing, promoting, and supporting competitive, integrated and community based employment for youth with disabilities. All students should have the opportunity to exit school employed and with a variety of meaningful, individualized work experiences leading to careers and other positive post school outcomes. This project offers students with intellectual or developmental disabilities the opportunity to engage in employment related services and activities during their transition from post high into adult life. Each year, DSPD sends out invitations to school districts across the state and asks for interested districts to complete a short application. This includes outlining the desire to participate, commitment to program requirements (phone calls, training's, collecting data, contacting parents, etc..), specific needs of the district, readiness to work with students who have significant barriers to employment, and what is currently being done to prepare students for life after school. DSPD then selects two districts out of the applicants to partner with for the following school year. The School-to-Work project trains teachers, para educators, administrators, etc.. on how to set up work based or community learning opportunities, discovering interests of students that could relate to employment goals, accessing adult agency resources, how to talk to parents about the value of employment, and other employment focused information. Schools receive technical assistance and support throughout the year from subject matter experts that are contracted with DSPD through Griffin-Hammis Associates including local Vocational Rehabilitation counselors, Department of Workforce Services WIOA Youth counselors, and employment specialist provider companies. This takes place in a collaborate way to assist students gain customized, competitive employment in a community setting. Participating schools select 3-5 students to participate in the program and will go through the "discovery" process, which is a personalized way of identifying an individual's interests, skills, and key vocational themes to help create a customized career development plan. This is part of a customized employment technique that aims to match people with meaningful work based on their interests and skills. After participating in the program, schools are then expected to have a goal of doing discovery and customized employment for all students moving forward. Patty Cassidy instructs on elements of Customized Employment and Discovery. 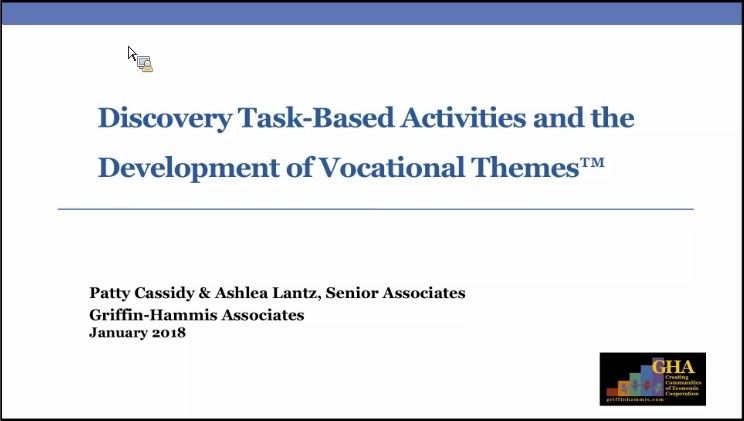 She shares ideas for selecting task-based discovery activities by exploring patterns in the job seekers life and experiencing a range of activities both familiar and unfamiliar activities to the individual. Patty teaches how to identify vocational themes based on the information learned from the discovery activities. 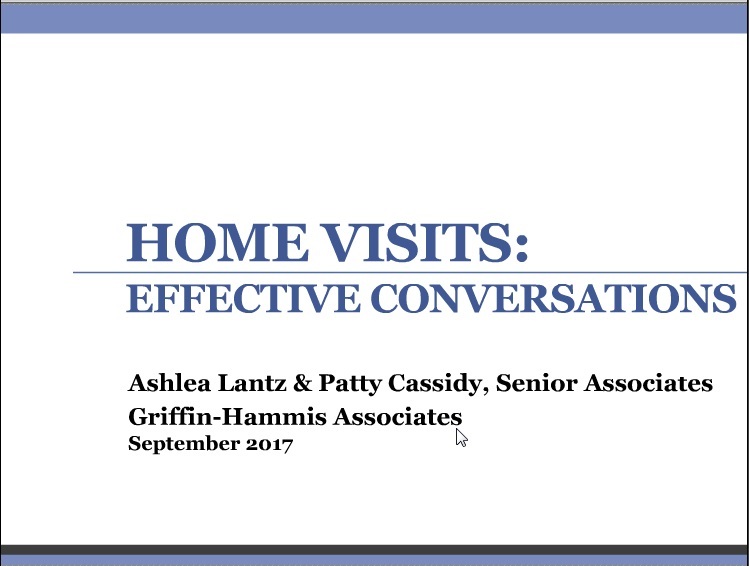 Ashlea Lantz and Patty Cassidy give guidance on conduction a home visit as part of the Customized Employment Discovery process. They give instruction on how to start the home visit, where to take what you learn from the visit and how to capture the home visit in the Discovery Staging Record. Marsha Threlkeld gives tools on how to communicate a clear and guiding idea or vision for your individual school transition program or employment organization’s school-to-work efforts. She talks about how to work jointly with all members of the team to understand Employment First and Community Integration, as well as articulate it to students and families. Marsha also talks about how your Transition Program can decide its own system to keep para educators, teachers, families, administrators and students on board and working towards the same transition focus. 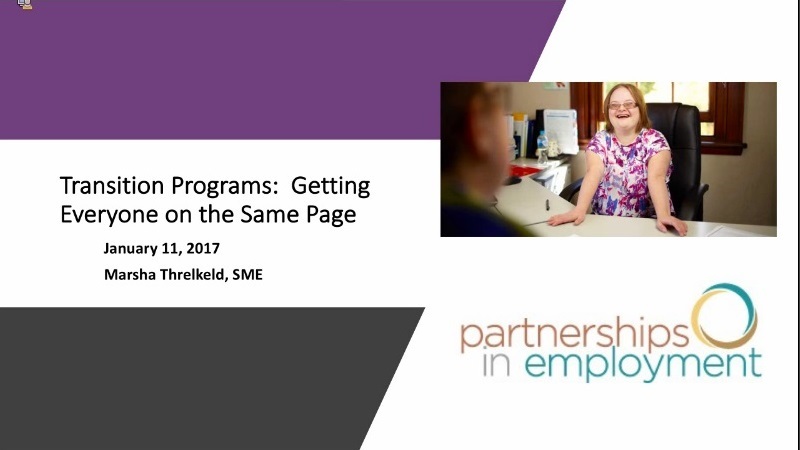 Ashlea Lantz gives a provider focused presentation on how to structure your business to provide customized, supported employment into your company. She discusses how to properly allocate staff time and resources and amalgamate funding to meet costs. 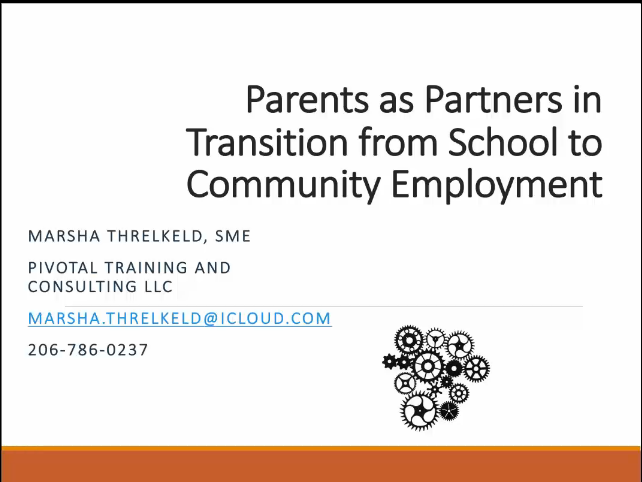 Marsha Threlkeld and Cathy Muarhashi share information on how families can be informed about employment and ready for the expectations of transition from school to work. What is the Employment First Plan?